Throughout middle and high school my friends and I paid a lot of attention to what the others were reading. We didn’t spend much time talking about books, but we noticed what the others were reading and asked for recommendations,* something that we, as boys, never asked a teacher. This was before the internet and text messaging, so the thick paperback you carried on top of your algebra book sent a message to the rest of the world louder and more clearly than a tweet or status update, which easily get lost in the white noise that is the internet. When I was fourteen and a freshman in high school, most of my friends were carrying around The Sword of Shanarra or The Elfstones of Shanarra. I never got around to reading this series, although the cover illustrations and the sheer thickness of the paperback editions were enticing. They were always on my to-read list, but it wasn’t until last year that I finally picked up the first book in this series and raced home to read it. It didn’t take me long to understand why fourteen-year-old me and my fourteen-year-old friends would like it: it has elves, wizards, swords, a character called Flick (an early nickname of mine), castles, epic quests, and bad guys. It’s not quite a Tolkien clone, but it does owe a debt of gratitude to Lord of the Rings. 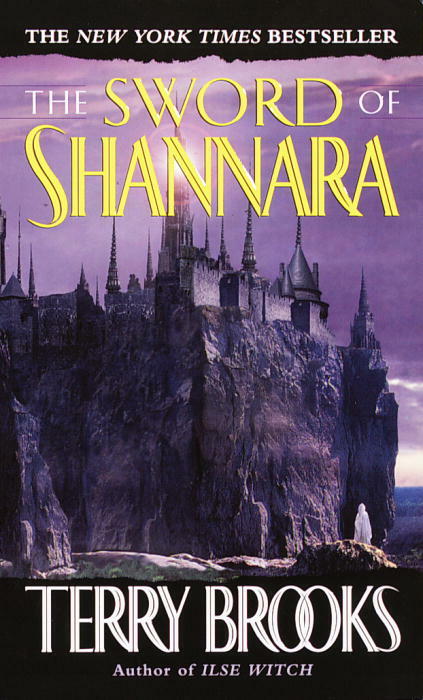 Without that trilogy and a lot of thirteen- and fourteen-year-old kids coming down from the high that is LotR and looking for their next epic fantasy fix, the Shannara books would have found their way to the remainder bin in short order. I wanted to like this book, because grown-up me has a great fondness for those things that fourteen-year-old me used to like. But I found myself waiting for the story and especially the writing to get better, only they didn’t. The plot is thin, the characters stereotypes, and the dialogue wooden yet lightweight, like a foundation with dry rot. Even though the characters spend a lot of time doing stuff, none of them seem to do anything important. They just putter around, waiting for next plot cliché. The biggest problem is execution: Brooks can’t (or won’t) write a decent line of prose. It’s almost as if he is determined to break every rule of good writing he can lay his hands on. If the cardinal rule of good writing is “show, don’t tell”, then a writer needs to avoid adjectives and adverbs whenever possible. Brooks writes as if he purchases them wholesale, and sprinkles them over his writing the way a muddy dog spreads paw prints on your new carpeting. A morning heavy with mist and damp chilled Shea and his companions the next day as they journeyed toward an absent sun through the mists in the highlands of Leah. Once over the top, they began a silent descent in single file to the lowlands beyond, at times almost scrambling on all fours to avoid the boulders and dead brush that hid in the fog and either tripped up their feet or grasped at their shoulder and hips. I haven’t shortened it much; Brooks’ original is 83 words and mine is 77. I use only seven descriptors, roughly half as many as the original. I am depending on nouns and especially on verbs to carry the weight of the narrative. We both use “journeyed” and “began” which is only fair, since we are both describing the same event. But let’s talk about the verbs that are left over. Brooks has followed, found, hiked and wound. Nothing wrong with these words in and of themselves, but they are all passive verbs; they describe no real intent or purpose. Anyone can do these things, often accidentally or on a whim. On the other hand, I have chilled, scrambling, avoid, hid, tripped, and grasped. In contrast to Brooks’ selection, these are dynamic verbs. Anybody can find something, and even little kids and grannies go hiking, but nobody scrambles, avoids, hides or trips without a reason. These verbs imply a possible intent. Dialogue attribution is Brook’s greatest weakness. I have written about this previously, where I pointed out that the best form of dialogue attribution is “he said, she said”. There is an eternal yet unfortunate quest to avoid the word “said”, but “said” not only gets to the point, it also gets out of the way. “That’s fine, coming from you,” Flick blazed up angrily. “All right,” soothed the lean hunter. “I suppose your plan is the best one,” interjected Shea hastily. “Climb a tree,” Flick suggested casually. “Climb a…” stuttered the other in unabashed amazement. There’s not a single “said” in the entire passage, and there are precious few throughout the entire book. The only purpose of dialogue attribution is to tell the reader known who‘s speaking, not how. The how should be clear from the context. Context is the key to effective dialogue. In fact, strenuously avoiding “said” requires the author and his readers to do some fairly awkward mental gymnastics. I’ve never seen anyone “blaze up” in a conversation, “soothe” is not a verb of dialogue attribution, the “lean hunter” is Menion, an interjection implies haste, the exclamation point at the end of “Agreed!” tells us that Menion is exclaiming (it is an exclamation point, after all), and although we are told that “the other…stuttered”, he actually didn’t. “C-c-cl-cl-climb…a tree…” is stuttering; “climb a tree” is merely talk. And while we’re at it, a suggestion that isn’t casual is an order; the word “suggestion” carries the connotation of “casual”. Likewise, I’m not sure how unabashed amazement is any different from ordinary amazement. When I was younger, I thought it bad form to give up on a book. But life is short and there are lots of books out there, and I don’t want to waste any time with the bad ones. Life is short, after all, and you eventually come to abhor wasting even the smallest of moments. So I made a deal with myself: I would read to page 100 (out of a 726 page book), and if the writing or the story didn’t get any better, I would set it aside. (I haven’t even talked about the story elements yet, perhaps because there are so few: they travel, at first by day and later by night—or maybe it’s the other way around; none of the scenes are particularly memorable—they meet mysterious strangers. I got to page 100 and set the book aside. Battered and exhausted, Menion Leah was one of the last to enter the walled city. The march to Tyrsis had reopened the wounds on his feet, but he refused to be carried. I’ve moved “battered and exhausted” to the beginning of the sentence. This emphasizes Menion’s condition and keeps our focus on him. It also allows me to omit the phrase “his lean frame”. This passage is about Menion, not his lean frame. I’ve eliminated “from the Mermidon”. If you’ve read up to this point, you know where they’ve come from. The job of an author is to provide only those reminders a reader might need, not to recap the entire plot. I’ve kept “to Tyrsis” as it focuses on their destination. I deleted “ten-mile”. If it’s important that the reader know this march was ten miles long, then the author should have mentioned it previously. If it’s not important, it’s fluff. Either way, out it goes. The wounds on his feet had reopened during the ten-mile march from the Mermidon to Tyrsis, but he had refused to be carried. It’s still wordy, but it is an improvement over its predecessor. I kept “he had refused to be carried” but changed it from a past perfect tense to a simple past tense by eliminating the word “had”. (Brooks has an annoying tendency to favor the pluperfect, making his writing sound like a legal brief. This is no surprise given the fact that he was once a practicing attorney, but this is still no excuse for sloppy story-telling.) Even though “to be carried” is still in the passive voice, this is an example where it works, because it both keeps the focus on Menion, and also because any active construction is awkward and wordy: “but he refused to allow anyone to carry him” just doesn’t work as well. I wonder what the fourteen-year-old version of myself would have made of this novel had he found time to read it. I was a discriminating reader in those days—in some ways more discriminating since I eschewed anything that wasn’t science fiction or fantasy. But the pull of what your peers are reading is always strong, especially when you are already an outcast in so many ways. In the end, I’m glad I didn’t devote any time to this book when I was younger, and I’m glad that I devoted less than a week (between reading the book and writing this review) as an adult. If legions of fourteen-year-old boys still find this book to be a good read, I hope they find other, better books to spend their time and money on. If you have read this book and enjoyed it, but couldn’t quite understand what it was less than perfect, I hope that you have a better understanding now. Either way, I no longer regret not reading this book in high school or giving it up after 100 pages. A friend of mine insists that the story improves, although the writing does not, which also describes the Twilight series. I am satisfied to let this series go and move on to greener pastures. Brooks, Terry. The Sword of Shannara. New York: Del Rey, 1977. Print.